The surface of Planet Earth comprises some 30 percent land and 70 percent water - our oceans, rivers and lakes. 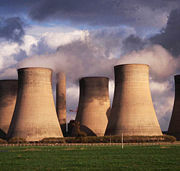 It is on the land surface part of the earth that soil forms. It is here that soil plays such a major part in supporting life on earth. The soil is rather like a thin carpet covering the land surface of the planet; most soils are less than three metres thick. Comparing this to the radius of the whole of Planet Earth, which is about 6,000 kilometres, one swiftly appreciates what a very thin skin it is. The thickness of the soil is miniscule compared to the thickness of the earth, and yet this thin layer on the surface of the earth plays a pivotal role in the existence of humans and indeed all land-based life on the planet. This very thin skin, soil, is a living entity, unlike the very thick rock core lying below. It contains billions of living organisms which help to form the soil and allow it to perform many marvellous feats such as producing most of our food, our forests and our wild flowers. We need to appreciate fully the importance of soil to planet earth and particularly to its growing number of inhabitants. There are several thousand different types of soil across the surface of planet earth. This is important because it enables us to grow a wide variety of foods and plants in the different climatic areas of the world, varying from date palms in desert soils, to tropical fruits in the jungle areas, and plants which can survive in some of the coldest areas of the world. Whenever summer comes, shrubs and grasses able to feed grazing animals appear from the soil. We should appreciate the part soil plays in all our lives! This website, presented by the National Soil Resources Institute of Cranfield University, UK, is dedicated to exploring and presenting the sheer variety of soil and related soil landscapes worldwide. 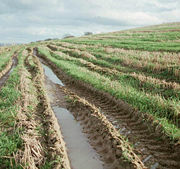 Embedded within the SoilsWorldwide website is the SoilPIC Photographic Image Collection and Archive, sponsored in part by the British Society of Soil Science (BSSS). SoilPIC seeks to present photographic imagery to depict the astonishing variety of soil types from around the world, together with the landscapes typical of these soils. 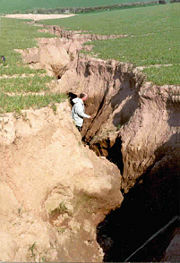 Soil-Net - a soils educational resource Part of Soil-Net is the substantial Soil-Net online photographic album. There are a number of Soil classification systems (Category: Soil classification systems) in use worldwide. These are used to differentiate the many types of soils worldwide. Photographs are being compiled and collated for each of the classification members. If you have an interest in helping with the SoilsWorldwide project or the parent World Soil Survey Archive and Catalogue (WOSSAC), see our accessions page. If you are already a SoilPIC editor, you can find instructions here: Help:Editors Instructions. Please be sure to contact us as we'd like to hear from you. Note this opens a feedback page on our sister 'WOSSAC' website. We will endevour to respond as quickly as possible.